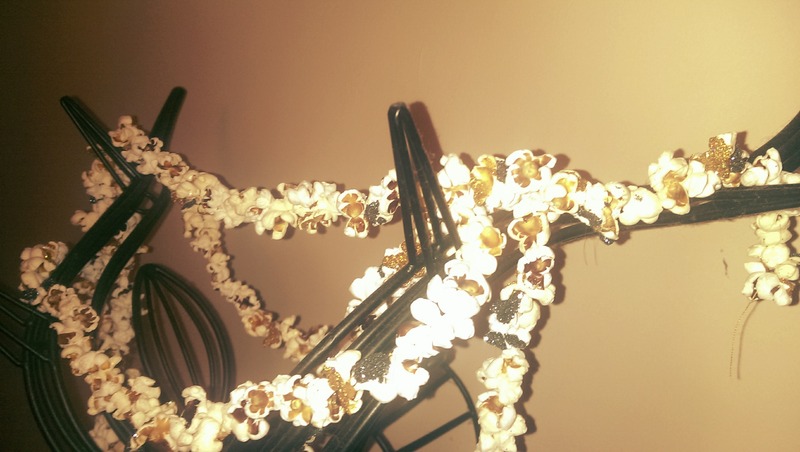 Crafty Christmas, deck the halls on a budget – This week, popcorn strings. It’s the most wonderful time of the year if you have disposable income. Apparently the average person spends around £400 each this time of year and I don’t know about you but that is over a weeks wages on one day on goose, trees and tat. However, i am not so jaded that i don’t like a bit of festive cheer around the place, in fact i like a tasteful Christmas (i have very rude things to say about tinsel and coloured fairy lights but i am snob) and as someone with the time to put into it i have decided to make decorations this year and share my successes with you. 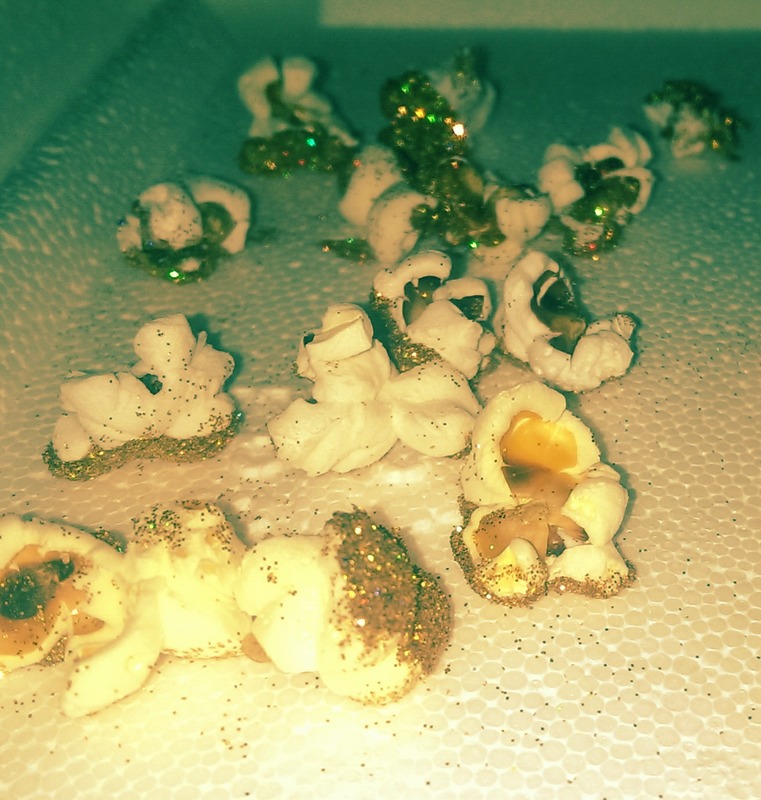 First up is stringed popcorn, it is a bit of a classic and i have glammed it up a bit with a touch of sparkle, gold and silver to be exact but you are welcome to let your imagination run wild. Don’t be tempted to buy ready popped popcorn that already has flavouring on it, you will just end up a greasy mess and if you have pets it will be like a red rag to a bull. I bought unpopped kernels and popped them at home myself which was much easier than trying to find the right stuff in the shop. The glitter i bought from Ebay, about 100g for around £2.50 a bag, you will need much less than this, around 50g would be enough. 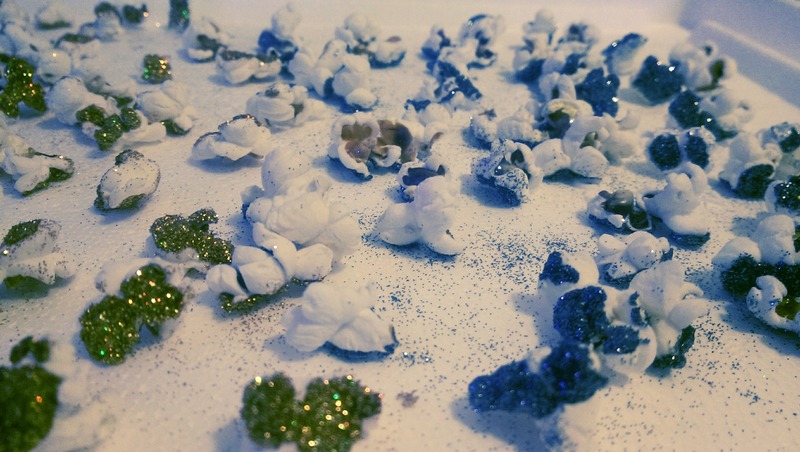 I was really charmed by the results, the popcorn itself make some great shapes (i got very excited every time i found one that looked like an octopus), the glitter catches the light nicely and you can potentially make meters and meters of it without much expense at all. Pop the corn according to the instructions and leave to cool, ideally overnight as stale popcorn is less crumbly. Tip some glitter into a small dish and pour out a little glue. 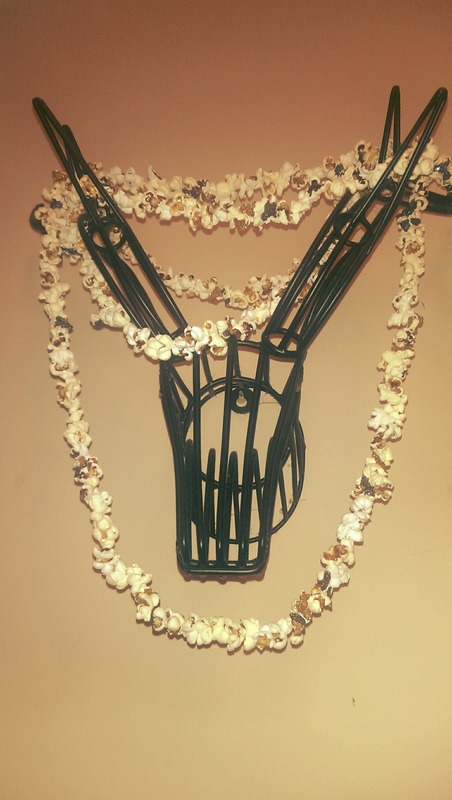 You will need a tray or some newspaper to put the popcorn on. 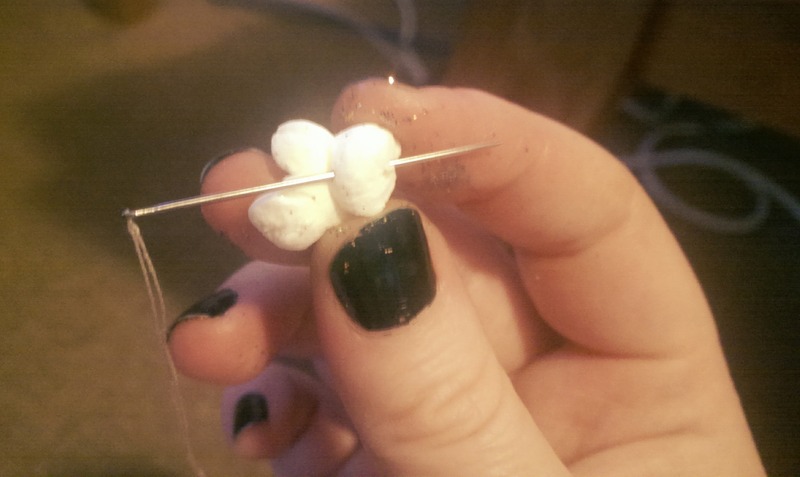 Thread your needle and measure out about a meter of thread (longer if you like), tie a knot in one end. Push the needle through the middle of 5-7 “plain” kernels, this might take a few tries as some parts can be a bit hard, watch your fingers, i gave myself a good stabbing so if you have a thimble, use it. 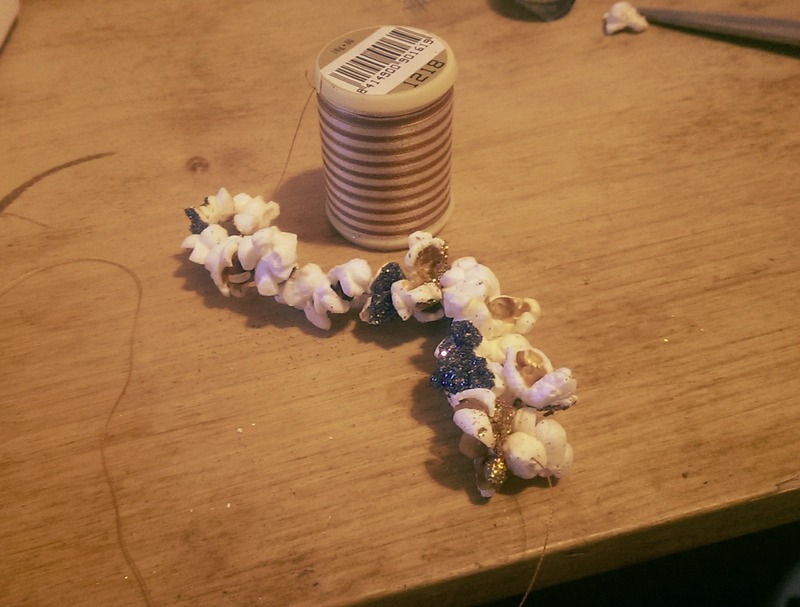 Push each kernel right to the end then thread a few glittery pieces on, repeat until you get to the end. 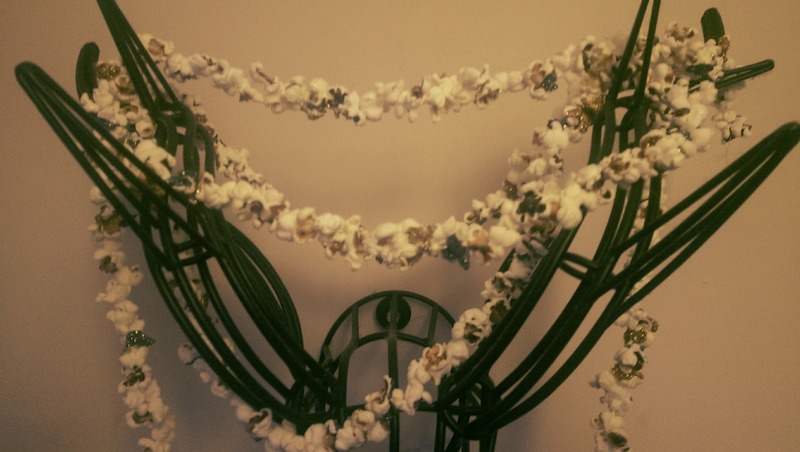 Tie off the thread and bravo, you have a very homemade and cheap decoration for the tree or around the house.